Are powder free vinyl gloves easy to put on when your hands are slightly damp to wet? In general, applying any type of examination glove is more difficult when your hands are wet to even slightly damp. The good news is that powder free vinyl gloves with their slightly less elastic tendency are a good option for pulling on even on wet skin. It is still recommended that you dry your hand completely, trapping additional moisture in the glove can result in skin damage over time and may cause irritation if soap or other compounds are trapped with the water inside the glove. Powder free vinyl gloves are easy to pull on and fit easily over most hand sizes. They do come in a variety of sizes from small to large but, in an emergency, they will stretch and can be worn by most people regardless of the specific size. The best idea is to have a box of each size available, or at least a small and a large, so staff can find a good match for their hand without having a glove that is too tight or too loose for comfort. What are the biggest advantages to powder free vinyl gloves over other types of medical examination gloves? Perhaps the single biggest advantage of powder free vinyl gloves over nitrile, latex or neoprene gloves for examination purposes is the low cost of the gloves. They are much more elastic than they used to be and are moderately effective in resisting tears with typical use. Although not recommended for use where punctures or contact with chemicals is possible, they still make a very low cost medical glove for a variety of situations. The variety of uses for this glove type is also a big plus. They can be used by all staff from janitorial staff through to medical professionals, avoiding the need to have a multitude of glove styles in the general facility. Since they are latex free, also a big advantage, there is no concern with allergic reaction either by contact or through inhalation. The cornstarch powder itself will not cause allergic reactions and since there is no latex it cannot carry the protein that causes the severe reaction seen in powdered latex glove use. Can powder free vinyl gloves be used when working with laboratory chemicals or chemotherapy drugs? Vinyl gloves of any variety, either powdered or powder free, should not be used with chemicals or chemotherapy drugs. The polyvinyl chloride or PVC is simply not recommended if chemical resistance is a high priority in the area where the gloves are in use. It is also less effective in puncture resistance, possibly leaving staff without the level of protection they need when working around these potentially hazardous materials. 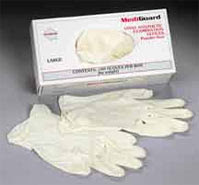 In these applications a latex or neoprene gloves are recommended over the vinyl option. While they may be slightly more costly they do provide the level of protection required.